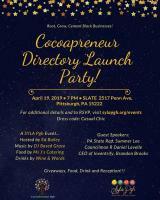 Cocoapreneur Pgh has launched the Black Business Directory! Come down to SLATE on April 19th at 7pm to find out more. Dress code is casual chic. The mission of Cocoapreneur is to foster an environment of economic prosperity in order to ensure more sustainable neighborhoods for the historically African American communities and neighborhoods around Pittsburgh, PA. Through support to businesses via advertising, marketing and consulting, Cocoapreneur aims to normalize the idea of entrepreneurship and make becoming a business owner a more feasible and attainable goal for African Americans in the greater Pittsburgh area.